Scooper - Technology News: Which regions will build the Silicon Valleys of the future? The idea of a company growing so quickly that it doubles it revenues in under two years immediately brings to mind the Silicon Valley tech giants. Yet such growth rates are far from being the preserve of companies in the developed world. In fact, "hypergrowth" is being cultivated in many regions around the world. While American and European markets may be known for fast-growing companies, market conditions in Africa, Asia-Pacific and in the Middle East and North Africa (MENA) regions offer some of the best opportunities for achieving hypergrowth, thanks to their rapidly growing economies and populations, as well as their substantial investment in infrastructure. Not only do hypergrowth companies exist in every region, they are facing tremendous challenges as they attempt to scale up and expand. The biggest obstacle that they all face – in common with companies growing at slower rates – is talent. According to Mastering Hypergrowth , the World Economic Forum’s study of nearly 200 companies around the world, over half (55.6%) of CEOs say that finding, motivating and keeping the best people is one of their most pressing challenges. Setting talent aside as a ubiquitous business concern illuminates a key insight in the project’s findings. 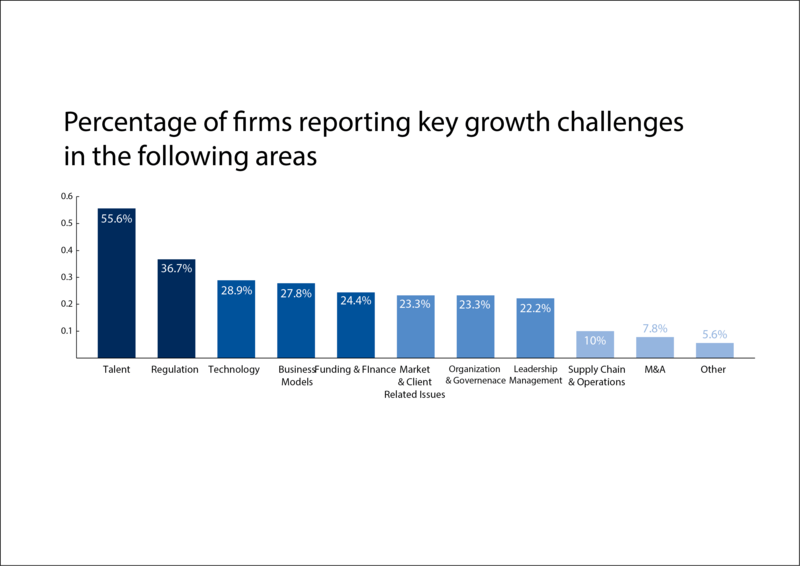 After talent, the primary challenges for hypergrowth companies vary, based on region. 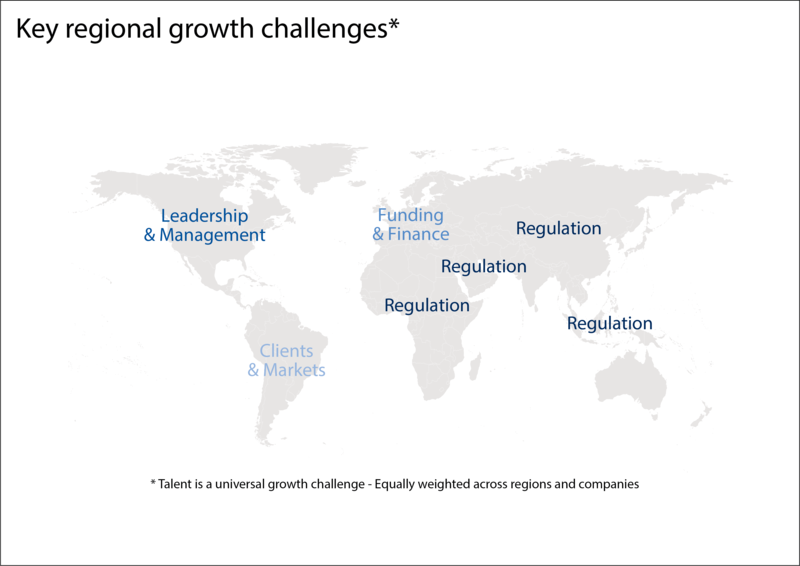 These challenges reflect the issues facing the business environments around the world and include dealing with regulation, access to capital, leadership and managing new markets, among other issues. Our research highlighted regulation as the biggest barrier facing hypergrowth companies in Asia-Pacific. Strict rules apply to company ownership structures and the movement of capital, limiting companies’ capacity to scale. Labour movement controls also often prevent Asia-Pacific’s skilled, highly educated workforce from travelling within the region. Change is coming, however, which could lead to an explosion of hypergrowth. In 2015, the Association of Southeast Asian Nations introduced the ASEAN Economic Community with the aim of eventually facilitating freer movement of goods and services, investment, capital and skilled labor among its members. Governments in the Middle East and North Africa are looking to diversify their economies away from their traditional over-reliance on oil, which creates opportunities for hypergrowth in a number of sectors. Already, fast-moving consumer goods and pharmaceuticals are big focus areas – and so are financial services. For example, the United Arab Emirates (UAE) has successfully established itself as the global hub for Islamic banking. Overall, the region has a huge amount of economic potential, but hypergrowth companies need to be experts at navigating regulatory requirements in order to tap it. Also, there are restrictions on the foreign ownership of businesses in certain industries. A single market in MENA would enable more hypergrowth companies to take off, as would the introduction of more collaboration between competitive free trade zones. The potential of the sub-Saharan African market is huge thanks to its abundance of natural commodities, such as oil and minerals, and its young and rapidly expanding populations. Already it boasts some of the fastest growing economies in the world including Ethiopia, Mozambique and Rwanda. Nevertheless, though most African companies are still small by international standards. Hypergrowth companies are being held back by the complexity and unpredictability of regulation in the region. In Kenya, for example, the laws and regulations made by national and county governments can conflict with each other and the financial services industry in Nigeria is very heavily regulated. Enforcement of laws and regulations can be uneven and sometimes non-existent. On the positive side, however, ambiguity gives companies with ambitions of hypergrowth the opportunity to engage with regulators to influence policy and regulations in order to avoid later fines. As an established market with a highly educated population, free movement and clear regulatory frameworks, Europe is a region where hypergrowth companies should thrive. But despite its booming start-up scene it has a risk-averse business culture, which has been exacerbated by the banking crisis. As a result, European hypergrowth companies can find it hard to create the right mindset and to source the finance that will enable them to hire talent, innovate and scale up their businesses from millions to billions in revenue. Low growth and poor productivity are issues in Europe and they make the region less competitive than North America. Recognizing this, individual European governments and the European Commission have supported programs that increase entrepreneurship and innovation. In response, accelerator programs have had a big impact in shifting the landscape, allowing European corporates to back start-ups and support entrepreneurs. With sponsors such as the Nordic bank Nordea, which launched an accelerator to accelerate fintech innovation in 2015, Europe is trying to remedy the risk-averse culture. Also, the Swiss market is boosting its presence in the fintech space and will soon compete with London through its Digital Zurich 2025 initiative . More than any other region, North America has successfully nurtured entrepreneurship and used technology to foster hypergrowth firms. Home to Silicon Valley, the global center of tech innovation, North America has a business-friendly culture and sophisticated technological infrastructure. Given that the region is a magnet for international talent, it is not surprising that cultivating the best leadership is considered one of the most pressing challenges for firms that want to make a name for themselves. Amazon’s Jeff Bezos, Microsoft’s Bill Gates and SpaceX’s Elon Musk are among the region’s most highly revered leaders – and so, of course, was Apple’s late Steve Jobs. The iconic status attributed to these individuals has encouraged the notion that if a company finds the right leader, everything else will fall into place. With so many businesses in high competition, US companies often perceive leadership as their key challenge to robust competition. For businesses past the start-up phase, the priority remains to establish leadership and management teams that ensure hypergrowth companies are strong enough to withstand the departure of a charismatic founder and sustain growth in a fast moving environment. Latin America has suffered some significant economic and political challenges in recent years. Brazil is in recession and mired in scandal, while Argentina has battled persistently high inflation. The region’s business culture has traditionally been family-oriented, while foreign investment is hindered by controls restricting the movement of capital in many countries. Given the limitations of the Latin American business environment, it makes sense that hypergrowth companies in the region view developing new markets and clients as their biggest challenge. Many Latin American hypergrowth companies increasingly see North America as their primary market – the US has the largest Spanish-speaking population after Mexico at 53 million individuals and a market that is worth an estimated $1.5 trillion, according to information provider Nielson . One of the most exciting things about hypergrowth is that it can take place anywhere. In fact, some of best opportunities exist in locations that may not seem outwardly conducive to doing business. The reason why hypergrowth companies succeed when others don’t is that they respond to their regional challenges in a way that actually powers their growth. This may be by influencing regulators to create rules that work more efficiently, partnering with other companies to enter a new market, seeking investment from unconventional sources, or developing leaders who are committed to embedding a founder’s values in the long term. Find out more about how the opportunities and challenges associated with hypergrowth vary according to region by reading our Mastering Hypergrowth study here .